Following my post on what size amp you need for gigs I received a very valid question on Twitter: Why amp->microphone at all? Why not just guitar->sound desk. This wasn’t a question I could answer in 140 characters, so I promised to write a blog post on it. Electric guitar pickups don’t sound very good on their own. 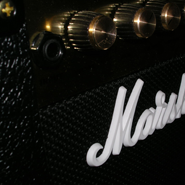 Guitar amplifiers significantly alter the raw tone of the guitar to make it sound better. A sound engineer could attempt to recreate this, but it’s not really his job to ‘fix’ your sound. There are various devices which emulate amplifiers and do allow you to plug directly into the desk. There are some downsides to emulators to do with hearing yourself on stage but that doesn’t mean they’re not good. There are some ways round the downsides to emulators. If you plug your electric guitar straight into the aux input on your Hi-Fi system it doesn’t sound very good. I know because I tried it today to research this article. This is partly because the signal from an electric guitar is very weak. The Hi-Fi isn’t designed to amplify signals that small so it doesn’t do it well. The nature of the electrical circuit formed by the guitar pickup, controls, cable and whatever it is plugged in to creates a mid-range boost at a certain frequency (called the resonant frequency) followed by a fairly sharp drop in higher frequency detection after that point. Combined, these factors mean that the ‘raw’ guitar sound is mid-heavy with very little treble, making it sound mushy and indistinct. It’s a bit like listening to it from underneath a duvet. It’s not terrible, but it’s not great either. It probably won’t come as a surprise that guitar amplifiers have developed to correct the problems with the raw guitar sound. The two were developed hand in hand so it’s natural that the amp counterbalances the tone issues. Specifically, amplifiers cut the mid-range allowing the bass and particularly the treble to be heard more clearly. This makes the sound more distinct and more like an electric guitar as we know it. To be completely clear, when you have all your amp tone controls set to 5 it will be applying a mid-range cut to your sound. The exact frequency and amount of cut will depend on the particular amp and manufacturer. 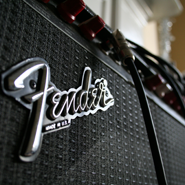 It is a significant part of what gives different amps their particular sound. There is a little programme which gives a visual display of amplifier frequency responses at different tone control settings for those of you who want to delve deeply in to the nuances of amplifier tone. Can you go direct to the desk and get the Engineer to apply the relevant EQ adjustment? I guess you could but I wouldn’t recommend it. Firstly, I don’t think the Engineer will take kindly to it. He (or she) is not there to fix your guitar tone, he’s there to get your sound out to the audience. That’s what you want him concentrating on. You should be providing a good quality sound to make this as easy as possible. Secondly, even if you could talk the Engineer into doing it for you, it means you are no longer in control of your sound. You can’t make adjustments without attracting the Engineer’s attention and asking him / her to do it for you. If you’ve ever been in the situation where you’ve had to try to do that mid-gig you’ll know how hard it is. It also looks unprofessional if you’re waving and gesturing at the engineer, or worse, having to ask for changes over the mic between songs. An amplifier is not just the way you make your guitar louder. It is 50% of your instrument. You should know it as well as you know your guitar. Understand how it works, how the different controls interact with each other and with the controls on your guitar. 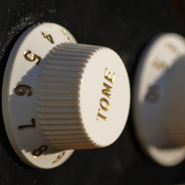 It is fundamental to creating the tone and sound you want to create. I wouldn’t want to hand that over to someone else. (I should mention that there’s a limit to how much control you have over the sound the audience hears because the Engineer may apply some EQ before it comes out of the PA. However, if you at least start with the sound you want you’ve got more chance of it being realised than if you rely on the Engineer to EQ your direct guitar sound. Also, on the point about control over your sound during the gig, I would caution against making big changes to the settings on your amp mid-gig because that may upset the Engineer’s front of house sound. However, you can make small tweaks if you need to). These days there are a number of devices that emulate amplifiers and allow you to plug directly into the desk. The most well known of the analogue ones is the Sansamp range which have been around since 1989. More recently with the rise of digital sound processing there are digital amp modelling units to suit any budget. You can get them in all sorts of configurations – stompbox pedals, rack units, standalone boxes or applications that run on a laptop or iPad. Amp emulation is incredibly useful for a number of reasons. Often you can get a much wider range of sounds than you can from one amp. They make it easy to switch between these sounds giving you more flexibility than one amp can (unless it has built in modelling itself). They’re also smaller than an amp so they’re much more convenient to carry. That’s especially handy for gigs abroad. Pop it in your hand luggage, check your instrument in the hold and you can fly out to any location knowing that you’ve got ‘your sound’ with you. I do this when I play abroad and for some gigs in the UK. One thing to be aware of is that these devices usually have a switch or setting to tell them whether you are plugging them into an amplifier or straight into a desk. This is because if you are going in to an amplifier you don’t want the mids cut by the emulator and also the amp – this would double up the cut unnecessarily. However, if you are plugging straight into a sound desk you definitely do want the emulator to apply the amp-like mid-cut. Make sure you know how to set this on whatever piece of kit you are using, but also try out all the options because sometimes I’ve found that the ‘recommended’ setting doesn’t actually sound best. Always choose the option that sounds best to your ears even if it’s not the ‘right’ one according to the manual. There are a few drawbacks to amp emulators. I’m not talking about whether they sound as ‘good’ as traditional amps. That’s very subjective and not something I want to go in to here. I’ve said before that I think the majority of your tone comes from you, not your gear. I don’t think the small differences in tone between emulated and ‘real’ amps (if any) has a significant impact on whether you should use one. However, amp emulators do create the problem of how you hear yourself on stage. Hearing yourself is vital for giving a good performance. If you have an amp pointing at your head then you know you will be able to hear yourself. If you use an emulator you will need the Engineer to put your guitar sound in the on-stage monitors so that you can hear what you are doing. The problem with this is that you may end up competing with other members of the band who also need to hear themselves in the monitors. 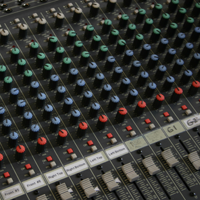 In smaller venues there might only be 1, 2 or 3 monitor mixes available. If you have to share a monitor with a singer or maybe a keyboard player or violin it may be difficult for one of you to make out your own sound. If you turn that sound up it might drown out the other one. On stage it’s important to have separation between the instruments. This allows everyone to hear themselves clearly and concentrate on their own performance. If people have their own amps this separation happens naturally. The monitors can be reserved for vocals and backing and a little bit of the other instruments but not too much. Everyone has their own sound source. If everyone goes direct to the PA then ideally everyone should have their own monitor. That way they can ask for the specific level of their own sound compared to all the others. However, smaller sound desks can’t provide many monitor feeds. Smaller venues may not have that many physical monitors available. If you end up having to share a sound source (i.e. a monitor) with someone then you may have problems separating the sounds and thus hearing yourself. That’s why many guitarists will bring an amplifier even if they are using some kind of amp emulator. There are a couple of ways to try to get the ‘best of both worlds’. You could take two outputs from your amp emulator (most of them provide this), one to the desk and one to an amp. That way the desk gets the pure signal direct from the emulator and you just use the amp for monitoring, giving you separation. No need for a microphone in front of the amplifier. A violin player I work with does this. Another solution would be to buy some kind of personal monitoring device such as an in-ear monitor (IEM). Most professionals playing big gigs use these. They mean you can move about the stage, you’re not tied to a sound source. You can also control the levels to your exact specification without affecting anyone else on the stage. They’re not cheap, although they are comparable in price to a good guitar amp and they are more portable. They can be a good option if you really want to ditch the amp. There you have it. The reason we don’t plug guitars straight into the desk is due to the limitations of guitar pickups which amps correct. It is possible to go direct to the desk using an amp emulator as long as you are aware of the potential issue of sound separation on stage and have thought about how you will address it. I’ve learned a lot researching this question and it’s been good fun. If anyone has any further questions fire them at me in the comments or on twitter (@matthelmguitar) or however you like. Thanks for this article. I’ve been using my Les Paul at open mic nights going into a PA. At first I thought the muddy sound was because of the impedeance so I bought a DI box and then plugged into the PA. There was some improvement in sound but not a lot. It’s only recently that I’ve realised I need some sort of amp sim. At the moment I’m considering the pocket pod or the original guitar pod. Luckily I only play solo at the open mic nights so hearing myself shouldn’t be a problem. Any suggestions on what amp sim I could use or how to get a more amp like clean, clear sound would be welcome! Hi Atul, you’re exactly right, you need some kind of amp simulator to get a more ‘realistic’ sound. Personally I would recommend the Joyo American Sound pedal (http://www.joyoaudio.com/en/product/show_110.html) which imitates a Fender Amp type sound. Great for clean. It’s all analog too, so no digital modelling (not that digital is a bad thing, I just like analog stuff). It’s really cheap too. If you want to get a pod, make sure you try one before you buy it. I’ve often found it difficult to get good clean sounds from older models (Pod 2.0 specifically). I think the newer versions are better, but definitely try it out first. They’re good for overdriven and distorted sound, but their cleans can be a bit lacking. Other good options are the Sansamp range of pedals (The ‘Blonde’ is their Fender sounding one), or perhaps a MultiFX unit that has some kind of amp modelling built in like the Boss ME25. There are loads of options out there, so do a bit of research and you’ll find plenty of options. Hi Matt – I own the Joyo American sound and I am wondering what is the best way to run into a P.A. – 1/4 inch guitar cable straight into the line level input, or 1/4 inch to XLR cable running into the mic level? The Joyo seems to have a much higher output than standard pedals – so I’m guessing it’s closer to line level. My next rehearsal will be the first time I attempt this – and I don’t want to damage the P.A. Yes, going in to the line input would be the best way, although either will work as long as you are careful how you set the Input Gain on the PA channel you are using. 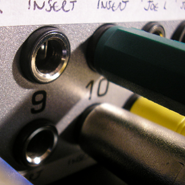 If you are running cables over long distances (more than a few metres) then it might be worth using a DI box and running an XLR from that to the mixing desk. That will cut out possible interference along a long cable run. That probably isn’t an issue for rehearsals, but worth keeping in mind for gigs where the mixing desk may be much further away. Ok thanks Matt, that’s very useful advice. I have a very old Boss multi FX somewhere and I’ll check if it has an amp sim. Otherwise the Joyo looks v cheap. I even saw some YouTube footage of it being used and it would be a really good solution for my solo open mic sound. Hi Dylan, can you give me a little more detail of what you’re trying to do? Do you mean can you plug your guitar straight in to Garage Band? Or are you asking if you can plug your guitar into Garage Band and then take an output from that to the PA? Or something else? If I used garageband instead of an amp sim. So yes, then into a PA.
As long as Garage Band has some kind of amp simulator built in to it (or you have set up / EQ’d a sound you are completely happy with) then that would be absolutely fine. Make sure you turn off any other system sounds on the computer so you don’t get any unusual beeps and pings if someone sends you a message or something. I’d also recommend closing all other applications and disconnecting from the internet while you are playing. You want the absolute minimum chance anything will crash or go wrong on the device you are using. I have a PodHD500. How would I go about connecting it to a PA? Would I need an XLR cable? Coming out of the balanced output with an XLR cable into the mixing desk of the PA is the best way. However, you could come out of one of the unbalanced outputs with an ordinary guitar cable and plug that into the desk. That will still work, it will just be a little more susceptible to interference than an XLR, especially if you’re using a very long cable. Hey Matt wondering if you could help. I’m going to be working in the Caribbean next month dong a loop pedal show but i’m worried as i’m going to be going straight into the PA system of the venue with an electric guitar. I’ll be going guitar into tuner,delay, reverb, then into a boss Rc300 loopstation. the loop station will then have to go straight out into the mixer and through the PA. Would I need a DI box? And i’m a little confused about if i’d need a preamp pedal or not in the loop? Please help! Thanks. Good questions. I think for the best sound some kind of amp modelling pedal would be good, otherwise your guitar might sound quite thin. If you’re on a budget then Joyo do some good cheap cheap amp emulator pedals. The American Sound is a Fender amp emulation, AC Tone is Vox like, British is Marshall and California is Mesa Boogie. There’s a YouTube review of three of them here. The American Sound and AC Tone are probably best if you need clean sounds, the other two overdrive quite quickly and are harder to get crystal clean sounds from. If you have a bit more cash to spend then SansAmp do more advanced versions of the pedals. Check out their website for the various options. The Character Series, Classic or GT2 are all great. If you can, get to a store and try some out. I would suggest putting the amp pedal after the tuner but before the Delay, Reverb and Loopstation. Regarding a DI Box, I don’t think you will need one. If you are just running a normal guitar lead (no more than 30 feet) from the Loopstation to the Mixer I’m sure you’ll be fine. I hope that helps a bit. Give me a shout if you need any more info. Hey Matt! What if I have to plug directly to a PA and I want to use the pedals I normally use? Can I just use a Pod for amp simulation and my normal drive and distortion pedals?? And where in the chain should the pod go?? Thanks for the article!! Yes, you can put pedals in front of an amp simulator (such as a Pod) just like you would a normal amp. As for pedal and Pod order, any pedals that you plug in to the front of your normal amp should go before the Pod, any that you put in the effects loop of your amp should go after the Pod. If you put all your pedals before the amp that’s nice and easy, the Pod is the last thing in the chain. If you use some in your effects loop put those after the Pod to get a more similar sound to the one you’re used to. Let me know if you need any more detail on any of that. Thanks Matt – good article – I have had really good success using a Vox Tonelab LE which, in addition to effects and amp/speaker emulation, has an output EQ which allows me to tweak the overall sound of all the patches to the system. My question is: occasionally when I split the signal to have a small amp on stage I get significant buzzing in the PA which of course is unacceptable to the rest of the band. It tends to happen more now that we have switched the PA to powered speakers rather than a power amp and passive speakers. Are there any solutions to this? It doesn’t happen all the time so I assume there is something about the lights or power in certain venues. It sounds like you have a ground loop, which is caused when there are two amplifiers, each giving your signal a different route to ground. The way to test this is to unplug the cable going to the Amp from the Vox Tonelab unit (at the Tonelab end). If the buzzing in the PA stops it’s definitely a ground loop issue. 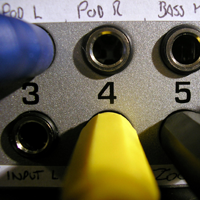 If it is a ground loop, the best solution would be to get a Passive DI box and put that between the Vox Tonelab. That will separate the signal from the PA’s ground, eliminating the loop. Make sure it’s a Passive DI, not an Active one. i have a pedal board but no amp… i am thinking of plugging it directly to p.a with a d.i in between ….will it work? What kind of pedal board is it? If it is something like a Boss GT or Line 6 floorpod then you will be fine, because they have amp emulation built in. If it is just individual pedals without any amp emulation it won’t sound very good (particularly the overdriven and distorted sounds). If you don’t have an amp how do you practice and set up your sounds at home? Do you use headphones or do you do it all in a rehearsal studio? If you can give me an idea of your set up I can advise you in more detail. I play in church using in ears all the time. I want to run a boss BC 2, or maybe a boss FBM 1 into a di box into the PA system. Is that a good idea? It might work. Those Boss amp style individual pedals don’t have any speaker and speaker cabinet emulation, so they’re not quite as ‘complete’ a sound as a full amp modelling pedal like the Joyo, Sansamp or Line 6 stuff. However, if you’re happy with the sound you’re getting out of them then they should be fine for what you want to do. but I found out that there is huge noise when the pedal is switched off. when the pedal is switched on, I guess it works properly. My amp is Yamaha thr10c. Is there any possiblity because of connection with thr10c? When I connected with my old 15w small amp, there was no noise. I am wondering that the amp emulation pedal like joyo american sound has another using method unlike usual pedals. My best guess is that it’s a faulty pedal. The American Sound works just like any other pedal, there is no different method for using it. I would double check it, using just the Joyo pedal, going straight from guitar to pedal to amp (with no other pedals). Try different cables, guitars and amps, just to be sure you’ve covered all options. Try it with a battery in the pedal and (separately) using a power adapter. If you do that you can be absolutely sure it’s not anything else in your signal chain. If it’s still making the noise, take it back for a refund / exchange. If you bought it from an actual shop (does anyone go to those anymore!) then you could take your guitar and amp in to the shop with you so that you can try out the replacement before you take it home – that’s why it can be worth buying from shops even if they’re a little more expensive. I can’t think of a reason why it would be a problem with the THR10C itself, but without being there to try out options with your equipment it’s hard for me to say. I have had situations where other pedals in my signal chain have caused noise through the American Sound and I’ve had to rewire my pedalboard during soundcheck (a stressful experience – but then you can’t be too fussy with a pedal that costs £30). However, it shouldn’t do it if there are no other pedals in the chain. The American Sound should be placed after all the wah, overdrive and compression effect pedals you use, just as your amp would normally go after those sounds. For modulation, delay and reverb effects it’s up to you whether you put them before or after the Joyo. I hope that helps a bit. Good luck with it. I hope you are still monitoring this because it seems like you are really “in the know” about this stuff and the info seems hard to find!!…..anyway.. Here is the deal..I have a boss gt-100 with preprogrammed patches that should work well thru a PA. patches are set to line out/headphones…Have a DI box to run to the mixer. No issues there…BUT, I would like to get a decent/usable stage volume myself just for safeties sake. What would be the best way to do this? Can I go out of the Boss into the effects return of an amp? or what would be the best way? You are exactly right, take the Left output from the GT-100 to the DI, and the Right output to the Effects Return of the amp you are using as a stage monitor. Just be careful that you don’t have any Stereo effects on any of your patches (usually Chorus or Delay) because they won’t sound right using that configuration. Front of House will only hear the Left side of the effect and you will only hear the Right side on stage and it will sound weird (unless that’s an effect you’re going for!). As a word of caution, I have tried using a GT-10 going direct to the sound-desk before, and there have been occasions where it sounded dreadful. I know it’s meant to emulate amps, but I certainly remember one gig with the GT-10 where my sound was just thin and weedy going direct to the desk. Luckily I spotted it at the soundcheck and was able to swap it out for a pedal board with an Joyo American Sound on it instead, which sounded fine. I’m certain I had the GT-10 set up as line-out/headphones, and it had sounded fine through my acoustic amp at home, but when I got to the gig it was awful. Maybe the GT-100 is better, but if I were using that setup I would have a proper amp emulator pedal (and power supply) in my gig bag just in case I couldn’t get the sound I wanted going direct to the desk from the GT. That’s made me think, make sure you get out to the front of house to hear your guitar sound when you are going direct. So you’ll need a long cable, a wireless system, or a mate to play your guitar for you while you go out front and listen. I only noticed the problem with my GT-10 because we had in-ear monitoring, so I could hear what the Sound Engineer was getting. If you’re using your own on-stage monitor you’re in the dangerous situation of having no idea how you sound out front. My GT-10 sounded fine through an amp, and I even used an acoustic guitar amp to better replicate the ‘flat’ response of a PA. But it was feeble when it got to the sound desk. If I’d been monitoring through my acoustic amp I’d never have known. That’s probably more detail than you wanted, but hopefully you can benefit from knowing about problems I’ve encountered and have contingency in place. Hey Matt, you seem to be really helpful in figuring this out. Maybe you can help me out, that’d be awesome! I play at church, and would like to have my board go to my amp, and to the PA (stereo setup). Alright, currently I have my guitar go into my pedal board and that feeds into my Vox AC15C. The last pedal (Digitech Supernatural) allows me the possibly of a stereo setup. I’d like to split that signal so that one goes into the amp, and the other goes into the PA. I have a direct box, but I’d was wondering what the difference between a amp simulator stompbox, and a cabinet emulator would be? I was recommended that the new Digitech CabDryVR would get the job done. Any thoughts? Thanks for your help! Impressed that you’re as active as you are. Hi Aaron, sorry it’s taken me a while to reply, you’ve caught me on a busy week with lots of gigs. You are exactly right that you can use the Supernatural to split your signal and take one feed to your on-stage amp and the other to the sound desk via some kind of amp emulator. Just beware that if you use a reverb sound that does any kind of fancy stereo panning, you will only hear half of it out front, and the other half on stage. So ideally you want to stick to a mono reverb patch on the Supernatural, if such a thing is possible. If you can’t do that then using a different reverb pedal before the Supernatural would be better, so you never actually switch the Supernatural on, you just use it as a splitter. Or alternatively you could buy a dedicated signal splitter and keep the Supernatural as your reverb pedal. It’s just something to be aware of when using a stereo effect to split your sound and only giving half of the stereo signal to Front of House. Regarding the amp / cabinet emulator, my basic understanding is that an Amp Emulator imitates the amplifier, with all its tone shaping and overdrive possibilities, and usually the speakers and cabinet as well (do check the small print to confirm this). I know the Joyo Amp Emulators and the Sansamp ones definitely feature cabinet sims, whereas the Boss FBM and FDR don’t. On the Sansamp you have the option of turning off the cabinet sim in case you are going in to an amp or you want to use a different sim. The CabDryVR is just a Cabinet Simulator, so it won’t have any of the tone shaping and overdrive features that an Amp Emulator will. It just models the response of speakers and the wooden box they’re in. In the past I would have said that you need some kind of preamp or amp emulator as well as the cabinet sim. However, they are definitely trying to market the CabDryVR as a ‘direct to desk’ option. I can only imagine that people who use it that way are getting the sound / tone sculpting they want out of an overdrive pedal, and are just using the cabinet sim to fill out the sound. Personally I wouldn’t use a Cabinet Simulator on its own without some kind of Amp Emulation before it. Maybe I’m behind the times a bit – if you have time to try the CabDryVR with your favourite overdrive pedals, through a PA (not an amp!) and you can get a sound you like, then that’s fine. Go for it. But for me I’d get a Sansamp or a LeClean (or a Joyo if my budget didn’t stretch to the others) and use that. It gives more control over the sound. I hope that helps a bit. Good luck with it all. Let me know what you decide to do and how it works out for you. Hope you are doing well and still looking into this post. Find out this and actually does help me a lot to understand reason behind. I’m using NUX MG-100 modelling guitar processor. Last week I had plug in my electric guitar with my NUX MG-100 thru DI box and directly to PA. The sound is still much mushy although the EQ in PA already adjusted. For this case, is the Joyo American sound amp simulation pedal can help me to improve the sound? Or I still need any other gadget/pedal? I don’t know the NUX MG-100 unit well, but from what I can read about it online it should work as an amp modeller on its own without needing any other amp simulation. It claims to have amp and cabinet modelling built in. My advice would be to test it in a PA situation. By this I mean plug it in to a PA if you have one, or if not into your PC monitor speakers, or the AUX on a home stereo system or some other ‘full range’ speakers. NOT a guitar amp. If you don’t have access to anything like this at home (or through a friend) then rent a rehearsal room for an hour and use the PA there. Then set up your sounds through that system. Make sure you have Amp AND Cabinet modelling switched on for the patches you create, or it will sound rubbish. Once you’ve done that, save those sounds and those are the ones you should use going when DIing to the PA in future. Remember that these sounds won’t be great when you are using a guitar amp, so you will need to create different patches for that situation. If that doesn’t work it might be that the amp and cab modelling in that unit aren’t all that great, and you should keep them switched off, just use if for effects and get a Joyo American sound or similar instead. Hi Matt – thanks for the article and the very helpful responses to the questions. I’m going to run from guitar to a boss gt1 and then into an RC2 looper and then into a mixer in a hotel conference room next week. An answer above suggests that will be ok – sounds ok in headphones too.